Shaun Duffy tending to his loaves. 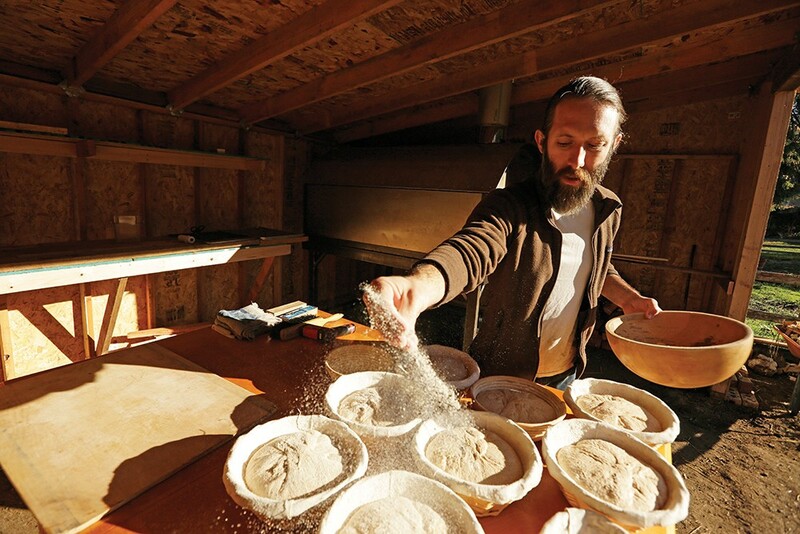 Bread has gotten a bad rap, says Shaun Thompson Duffy, who bakes bread, consults with bakeries, teaches classes and, most recently, mills his own flour. "Gluten-intolerance people have tons of theories about it," says the 36-year-old chef-turned-baker, who has dedicated his career to exploring artisanal breadmaking. In particular, he wondered why people with gluten intolerance reported that they could eat the breads he creates. Duffy, who owns Culture Breads, offers a monthly subscription service featuring bread and fresh-milled flours. Was there something about modern bread that was inherently different from his bread? Was it the modern wheat, Duffy wondered? Was it pesticides, lack of fermentation, the milling method, or even the type of yeast used in commercial breadmaking? Or maybe a combination? "What I do is just hit the reset button and go back to baking, basically, before industrialization," says Duffy, who does not claim medical expertise but has earned his chops in the culinary world. He's cooked in some of the America's most distinguished restaurants: at the Houston Country Club under certified master chef Fritz Gitschner; in Las Vegas at the Bellagio's Picasso restaurant under James Beard Foundation award winner Julian Serrano; and at various Texas locations under an adventurous Randy Rucker, who pioneered molecular gastronomy in the Lone Star State. Around 2001, Duffy noticed an increase in restaurant specialization. There were programs focused on desserts, charcuterie and bread. He recalls making what he thought was a clever brioche using goat whey. It inspired him to think of specializing in bread. "How can I stay on the cutting edge, still have a family and do my own thing?" he says he asked himself at the time. Bread intrigued him, in part because there wasn't a lot of information on artisanal breadmaking or alternative grains at the time. Duffy's research led him to seek out and learn from small-batch bakers who were often working in obscurity, then to experiment on his own. Wild yeast fermentation became an essential part of his approach. He uses the time-honored process of creating a sourdough starter that allows yeasts and bacteria that occur naturally in flour to develop. Bread baked with sourdough does not need to have commercial yeast added to it, and takes on a tangy flavor. At Tabor Bread, the first Portland baker to mill its own flour, Duffy fine-tuned his techniques. He relocated to Spokane in 2012, partially for his wife's job but also because of the region's wheat-based agricultural history. After working a few years with Spokane's Bouzies Bakery, Duffy struck out on his own in 2015 to build Culture Breads. Duffy recently found kindred spirits in DOMA Coffee's Terry and Rebecca Hurlen Patano, whose Post Falls, Idaho, business specializes in economic and environmental sustainability. The plan, says Duffy, is to mill flour at DOMA's facility using a newly installed granite stone mill. A "culture" is the backbone of bread; it's sometimes called a starter. It imparts flavor, inoculates the dough with precious bacteria so fermentation can commence, and eventually causes the dough to rise. 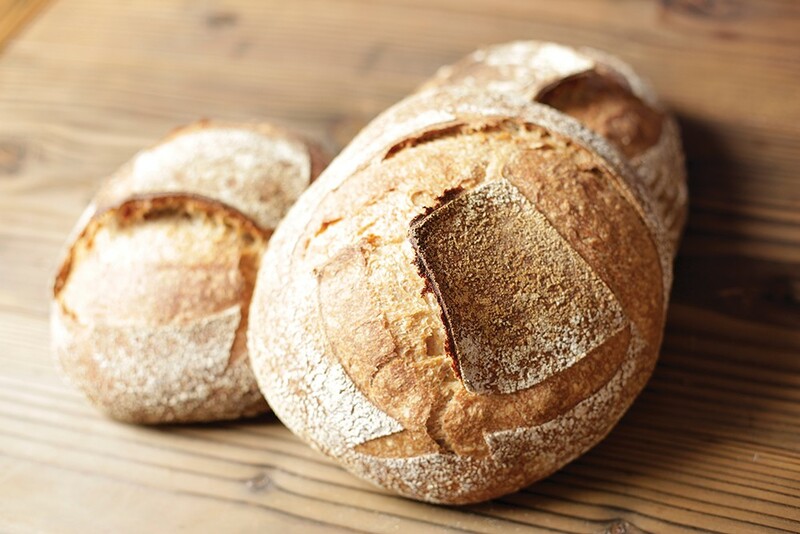 The "leaven" is a culture that's been built up and is ready to be incorporated into the bread. Fill a small, clean jar halfway with lukewarm water. Add enough whole grain wheat flour to the jar and stir until you achieve a thick paste with no lumps. Cover the jar with a piece of cheesecloth or a coffee filter and put in a cool, dark place (55 to 70F) for three days. After three days, you should see it rise and form bubbles around the sides. You just birthed a culture. Now keep it alive and give it a name. Discard all but 5 grams of your culture. Feed it fresh room-temperature water and flour. Stir to remove lumps and let ferment for 24 hours. Repeat process for three days to build up your culture's strength. The night before you bake, mix 5 grams of your culture, flour and water in a separate container. Let it rise and ferment. This is the leaven that you'll incorporate into your flour. Keep the remaining culture for subsequent baking, storing it in the refrigerator until needed. At least two days before you're ready to bake, build the culture's strength back up through Culture Management steps above, then follow Leaven Build steps. The most complex thing in this recipe is adjusting for fresh-milled flour. Commercial flour is designed to be predictable, so this recipe includes a small amount of organic, all-purpose flour to help beginning bakers get started. As your comfort level working with fresh-milled flour increases, transition to all fresh-milled flour. This recipe uses white wheat, not to be confused with white flour (which has been stripped of its valuable bran and germ parts). Wheat comes in all colors: golden yellow or durum or kamut, black emmer, and the majority of wheat grown in America, which is red or white. Mix flours, starter and water by hand. Once there is no more visible dry flour, let mixture sit, covered and undisturbed so the water can work its way into the tiny starch molecules. After an hour, add salt and mix by hand until salt is dissolved and dough feels homogenous, and ideally is 75 F.
Let rest five minutes, then "claw" the dough and mix till it comes back together. Let rest five minutes, repeat clawing. Bakers stretch and fold the dough to strengthen it. Lift up one corner or side of your dough (as if it were a square shape), stretching it gently as you fold it in toward the center of the dough. Repeat with the other three sides. Cover, leave on counter at room temperature in between stretching and folding. Stretch and fold every 20 minutes for the first hour only, flipping the dough every time. For next TWO hours, fold and stretch every 30 minutes. After the third hour let the dough rise, covered. Flip your dough on a lightly floured surface. Fold sides together into center, then repeat with top and bottom to create a square. Fold the opposite corners over each other, then repeat with the top left and bottom right corners. Flip the dough over so the seam is on the bottom. Cover with a towel and let relax about 20 minutes (longer if it's colder than 70 to 75 F). Lightly dust top of dough with flour, then gently flip over and repeat the shaping technique from Steps 2-4 above. Lightly flour a kitchen towel and lay it inside a bowl. Gently lift the shaped dough into the bowl and place into refrigerator overnight, uncovered. Place a dutch oven or lidded cast-iron pan in oven and preheat pan for at least an hour. Remove dough from fridge and sprinkle with a little whole grain flour to keep the bottom from scorching. Unmold dough into pan, "score" the dough with either scissors or a knife in a decorative pattern. Lower temperature to 500 F and bake with lid on for 20 minutes. After 20 minutes, remove lid, lower temperature to 450 and bake another 20 minutes. The bread should have a dark mahogany crust when you take it out to rest on a cooling rack. Congratulations! You have baked a whole grain, heritage loaf of bread that tastes and feels delicious.